Paul Gomberg has been selling real estate in Houston for 35 years, but he's never quite seen a home like 5623 Willow Walk Street. Hidden behind a charming exterior of mixed brick and stone and cottage-like roof peaks is a home Gomberg lovingly calls "Houston's filthiest house." What was once a regal home just a few short years ago is now filled with the fast food wrappers of countless meals, and the waste of an animal hoard grown unchecked for years that included cats, dogs and even pigs. BEFORE: A house dubbed the "filthiest house in Houston" by its realtor Paul Gomberg is filled with trash and animal waste. "I practically gagged," Gomberg said about walking into the property the first time. "I couldn't believe what I was walking in. 'How could anybody live this way?'" While some sellers might try to sugar coat a house that – at least from the photos – seems coated floor-to-ceiling in anything but sugar, Gomberg decided to go with a straight-forward approach. If the house was going to be sold as-is, his marketing of the house was going to tell it as it is. 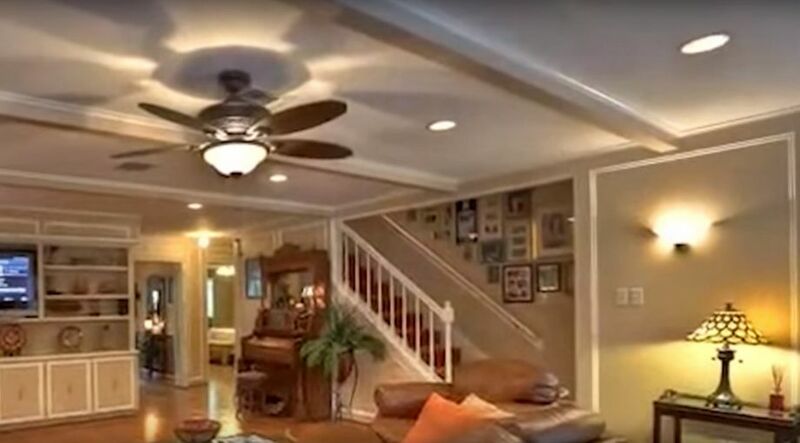 He and the "Rockstar Realty Group" at Keller Williams realty in Conroe posted a brutally honest listing on the Houston real estate site HAR.com – "Be prepared before you enter," it warns – and produced a 2+ minute YouTube video highlighting the homes worst features. "Let's travel back in time three years ago, when this house was in its glory days," the video begins, with glamour shots of the home in its better cared-for days. But from there, the video takes a turn. "Recently, 12 dogs, six cats and a potbelly pig lived here and converted this lovely home into a giant toilet." Footage inside shows hairballs and unidentified stains strewn across formerly glorious hardwood floors in the main living room. Trash is everywhere on the main floor. A mattress and box spring sit on a cluttered floor in the master bedroom – they come with the house, for interested buyers. Pet feces litter the floor in the master closet. Gomberg's photographer is seen wiping it off the bottom of his she onto a window ledge. "Forget it buddy," Gomberg tells the cameraman. "We're going upstairs and it only gets worse." There, they find a single can of Febreeze air freshener laying among piles of garbage and pet droppings. And in the pet's "playroom" next door, piles and piles of animal waste. At one point the cameraman passes out from comical effect, but it's not implausible to think others might do so spontaneously. "I just couldn't think of any other way except to put my own brand of humor and ... market a house that's virtually impossible to sell," Gomberg said. "Having the price point where it was ($125,000) and making a funny presentation was the best way to do things. "I've done a few like that before and the humor really helps. It blunts the shock somewhat." Gomberg said he and his "Rockstar Realty Group" don't specialize in horrid properties, but they don't run from them, either. The house has good bones: four bedrooms, 3-1/2 baths, and 3,494 square feet of interior on a giant lot that also features a backyard pool and a two-car garage. So perhaps not surprisingly, Gomberg already has a sale pending on the home after only 20 days despite the mess inside. A buyer who lives about a mile away was interested returning the home to its prior beauty. Gomberg wasn't sure if the buyer's intent was to live in the home or use it as a commercial venture. "He may turn it into a museum for the filthiest house in Houston," Gomberg said. "In my mind, there's a buyer for every home. It boils down to the price and how it gets marketed."